GUJCET 2018 Seat Allotment Results: Gujarat Admission Committee for Professional Courses has announced that the GUJCET 2nd round seat allotment result for Pharmacy and Engineering courses to be released on 16th july respectively. 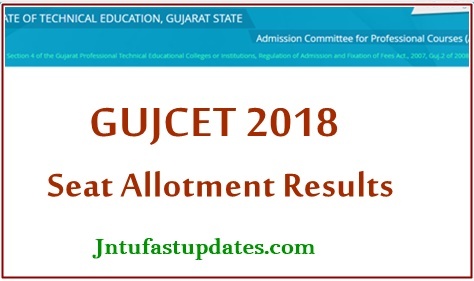 Hence the candidates who have come across the GUJCET for admission of Engineering/Pharmacy courses can download GUJCET seat allotment result from the official website gujacpc.nic.in or gujcet.gseb.org. candidates can visit any of the websites and check the details of GUJCET seat allotment for B.Tech and B.Pharmacy courses. Candidates allotted admission in the 2nd round will have to pay the admission fee to confirm the admission and have to report at the allotted colleges in the announced dates. Gujarat Common Entrance Test (GUJCET) has been conducted by Gujarat Secondary Board of Education (GSEB) in the month of April. Many of the hopefuls seeking admission into Engineering and Pharmacy courses have competed for the GUJCET examination this year. Based on the rank acquired in the examination, the students will be given admission into various courses in the state of Gujarat. Gujarat Admission Committee for Professional Courses (Gujarat ACPC) is responsible to carry out the seat allotment process for the qualified aspirants. The Gujarat Engineering/Pharmacy seat allotment result 2018 to be released on 28th and 30th June. Candidates waiting for the seat allotment results can check the further details from the following. Gujarat ACPC will announce the Gujarat 2nd round seat allotment result for Engineering/Pharmacy. Candidates allotted admission in 1st round seat allotment will have to pay the admission fee from 5th to 9th July for Engineering courses and from 9th to 13th July for Diploma b.pharmacy courses. Candidates can check the detailed information from the following table. How To Download Gujarat GUJCET Seat allotment result 2018 for Engineering/Pharmacy? On the homepage, click on Gujarat Engineering/ Pharmacy 2nd Round seat allotment result 2018 for Engineering/Pharmacy link. Enter the necessary details like the register number, password etc. The seat allotment list will be displayed on the screen. And make a printout of the Gujarat seat allotment order to report at the allotted college. When second round of pharmacy will declared? Sir /Mam when the result of engineering will be declared time??????? ?